Many AMS modelers will collect the relevant Eduard photo-etch sets for a given project, but they'll also go out and gather specific resin enhancements as well. Eduard has stepped up with a new product line to complement their photo-etched detail series - Brassin. Brassin is a play on words with Brass and Resin, and in many sets in this series, the resin details also include a set of color photo-etch as well. 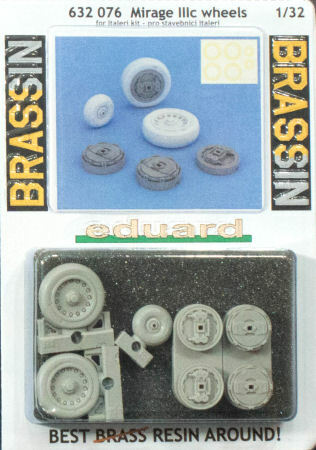 In this release, Eduard designed a replacement set of wheels for the Italeri 1/32 Mirage IIIC kit. This set is cast in gray resin and features beautiful detailing in the treads and wheel hubs. This set include the nosewheel, main wheels, and two sets of brake hubs depending on which aircraft you're modeling (check your references). This set is a drop-in replacement for the kit parts and includes a set of yellow-tape masks to make painting and weathering these parts even easier.